Hi everyone, my second tutorial! This time it's another simple, easy-to-achieve look: the mummy pattern. The mummy tape pattern is basically consists of placing tape strips of any size underneath each other, preferably a bit diagonally. This creates a funky design which looks a lot like wrapped ribbons, hence 'mummy'. So the good thing about this look is that you don't have to be precise in cutting your strips or placing them, but also it's perfect if you want to keep that lovely shade that's suffering from a bit of tipwear. First apply your base color and let it dry completely. Or you can do this tutorial on an older mani, like I'm doing. On the picture I'm wearing OPI Suzi Says Feng Shui that I applied the day before. As you can see there's a tiny bit of tipwear, but we're going to cover that up in a bit! Now cut off a little piece of tape off the roll, and then cut the piece in smaller strips lengthwise. You can make wide strips, or thin ones, parallel or divergent ones, just cut a bunch of different sizes to create a playful design. If you're done cutting, place the strips one by one on across the nail. You can leave space between strips to create continuous stripes, or let them overlap slightly at one side of your nail to create triangles. To solve tipwear of your old mani like I do, leave the tip uncovered like in the picture. 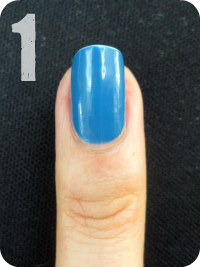 In step 3, a new coat of polish wil cover it up, making your mani look brand new again. You can also apply this trick to cover up VNL (visible nail line). Make sure the tape has fully adhered on the nail (it tends to lift up around the edges of the nail). 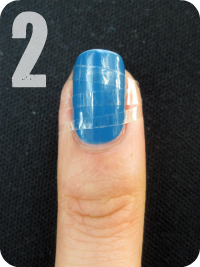 Then apply your layering polish and remove the tape strips right away. And by that I really mean right away! Because if you let the layering polish dry up too much, it's going to stick to the tape and when you remove the tape it can drag some polish with it and ruin the design a bit. So my advise is to do the painting and removing of the strips on one nail at a time. If you're using this design to cover up tipwear, I'd recommend to use an opaque layering polish, otherwise your tipwear will still be visible. Finally apply some topcoat, clean up, et voilà! Lovely combination! I like it a lot! I just did a taping with my first matte color. I think I might pick up a matte topcoat to play with my other polish. Good tip about putting on a normal topcoat first! Great tips and tutorial! I'll have to try this manicure soon, I really like it! Thank you. Super leuk :) Ik heb 'm uitgeprobeerd, en naar je tutorial en je site gelinkt in m'n laatste post. Keep up the good work! Hi Jamie, heb een eerste poging gedaan. Ben benieuwd wat je ervan vindt en misschien nog tips hebt ;-) ! My attempt at your mummy tutorial! @Anonymous: Thanks for the suggestion :) I actually tried painters tape once, but it gave me less crisp lines than cello tape, also I found it to be a bit too sturdy to lay flat on the nails. But perhaps mine's a different kind? Because it does work for a lot of other people. Thanks for leaving your tip though ^^ It might help other readers that have the same problem as you did. cool idea! i try this tomorrow! You are very creative. I just started following you... I am new to the blogging world but I cannot wait to try out some of your creations. Great tutorials.